This past couple of Spring Break Weeks we have seen alot more fishermen along with pleasure boaters out enjoying the beauty of Lake Texoma. The current lake level is at 618.44 with a water temperature of 55 degrees. We have had a couple of tough fishing days and a couple of rough weather days but overall we have had some great Spring Break striper fishing. With the warmer days water temperature is steadily getting warmer, putting the fish in a better mood or at least getting them in a biting mood. 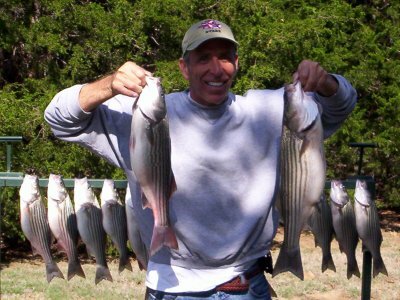 Read StriperMaster's Lake Texoma Fishing Report.